The impulse to invent and realize new music, new forms and a broader comprehension of sound has proven to be a permanent aspect of Marc Barreca’s work. From childhood music lessons, to tape and electronic experimentation with his group Young Scientist, to becoming an early participant in cassette culture and the independent movement, Marc has developed a large body of work that moves with and ahead of the changes that music has undergone in the past four decades. 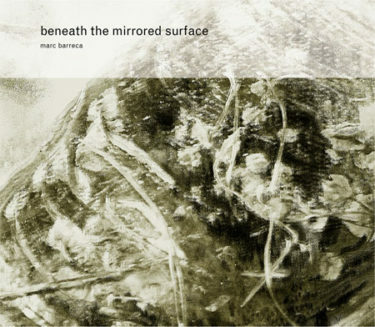 With Beneath the Mirrored Surface, Marc continues his quest to create deep and shifting aural spaces by merging the abstract rhythmic warmth of early analog synthesis with the complexity and timbral beauty of acoustic instruments and natural sound. Barreca extracted and reshaped rhythms and textures from field recordings, decades-old world folk recordings and acoustic instrument loops. These sources were first converted into MIDI data using Ableton Live and then transformed and manipulated with Max/MSP. Hundreds of these source clips were then blended and arranged with layered and looped digital synthesizer and sampler tracks. The result is a dense, rich world of refracted light and shifting shadow.